To follow are settings for the Electrovoice RE20 and RE320 mics. These settings also work well for the Shure SM7. To begin with, keep in mind that each mic is going to have a different output level and sensitivity. Start on the inputs page of the QOR. Each microphone input has a Pre-Amp gain and an Input Gain setting. Ideally you want to set the pre-amp gain several dB below what you would normally use. Then apply several dB of Input Gain. This will afford larger headroom for the pre-amp, and will allow a larger dynamic range without clipping the pre-amp. 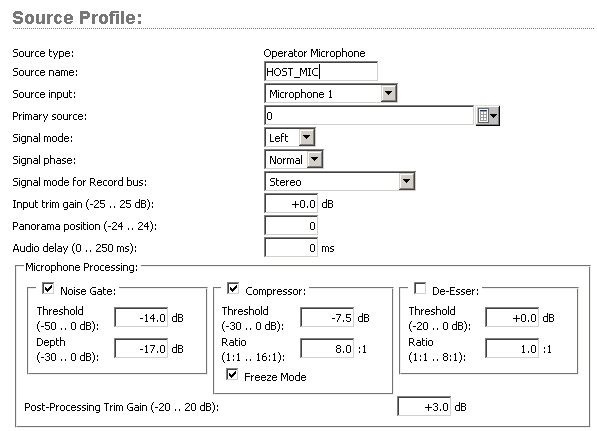 As far as adjusting the controls of the QOR mic processing, the compression ratio would be the first control to tweak. Adjust the value between 2.1 and 8.1 for “density” of processing. Then, adjust the threshold for the compressor. -7.5dB is adequate for most situations. You can adjust this value higher or lower in combination with different ratio values. People usually go too crazy with this setting, and then the expander won’t sound very natural because of the excess noise being pulled up. The Freeze Mode is recommended. Freeze Mode will “stick” the gain reduction on silent passages. This will make the voice processing sound more natural, especially during pauses in speech. It will also complement the usage of the expander. The Noise gate should be adjusted last. This acts like an expander and can be set to sound very transparent. A starting setting of -14dB for the Threshold and a Depth of -17dB can be used. This is a control that you will want to adjust from the console fader to fine tune, and then note the new values you have settled on and update the source profile. Within the QOR mic processor, the signal chain goes like this: MIC XLR → Preamp Gain → Input Gain → Trim Gain → Dynamics Processing → Makeup Gain → Equalizer → Fader on the console. There is an EQ setting for each mic source, and as you see in the flow chart above, it follows the dynamic processing. Have you discovered other settings? Let us know, and receive a Telos Alliance gift pack.